Naomi isn't allowed to feel too happy. Or sad. Or angry. She isn't allowed to love, or hate. Those are the rules. She's seen what happens when those rules are broken. Naomi doesn't care. Her friend's lives are in danger. Naomi is about to break all the rules. Almost 700 years ago, a fleet of colony ships was sent out from Earth. As their journey progressed, they grew apart, isolating themselves from each other as their societies began to change. Each ship developed their own internal structures, each their own way of keeping the peace, each, their own rules. As the ships approach Mission's End, they begin to reach out to each other after years of silence. They soon find out how different they've all become, and how deadly those differences can be. 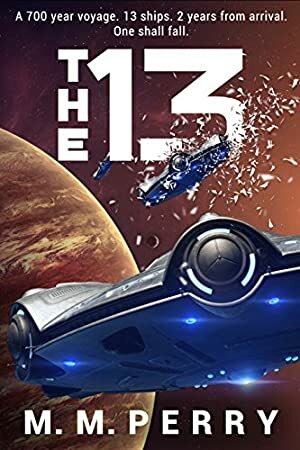 This is the story of the Magellan and the Tereshkova, sister ships in the fleet, and how the things that make them different, and those that make them the same, change Naomi's life forever. Log In to track M.M. Perry on eReaderIQ. to be notified each time the price drops on any book by M.M. Perry. to stop tracking M.M. Perry. We started tracking this book on June 29, 2017. The price of this book has changed 15 times in the past 665 days. The lowest price to date was FREE last reached on October 12, 2017. The highest price to date was $3.99 last reached on October 13, 2017. This book has been $3.99 7 times since we started tracking it.